Deal Categories: Gym Apparel.Stores: 13 Deals. 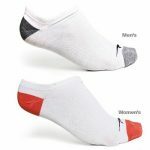 Today only, 13 Deals offers 10 Pairs of Sport Essentials Performance No Show Socks, in White color for $6.99 with free shipping. That’s the lowest price we could find. One day blowout sale at Reebok with Extra 50% OFF Sale items coupon – dropping the prices of over 1000 items to all-time best. With prices for [Men apparel] dropping to as low as $7.95 after coupon. For example, Pictured Reebok WOR Tech Sleeveless Top, drops from 17.98 to 8.98 after coupon!